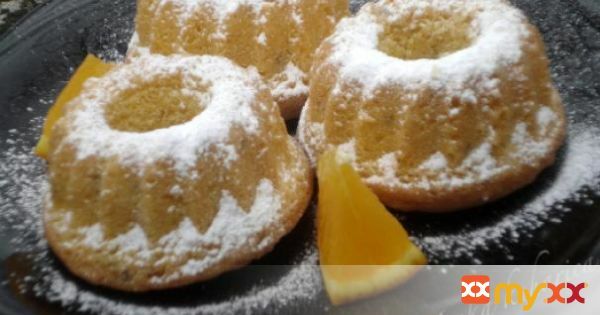 Moist Martha Stewart mini bundt cakes full of anise and orange flavor. 1. Lightly toast anise seeds on medium flame. 2. Whisk eggs, yolk, granulated sugar, orange zest, and anise seeds in a medium bowl until foamy. 3. Add oil in a slow, steady stream, whisking constantly until combined. 4. Whisk flour, salt, and baking powder in a small bowl. Carefully fold into egg mixture. 5. Divide batter evenly among 6 mini bundt molds - If the molds are silicone, greasing is not necessary, and if they are metal, coat them lightly with oil. Bake for 20 minutes at 170˚C until light gold and done. 6. Let cool in molds for 10 minutes. Invert cakes onto wire racks, dust with confectioners' sugar, and serve warm.